Sunflower quilt featuring 22 very large flowers appliqued onto a pale yellow field. 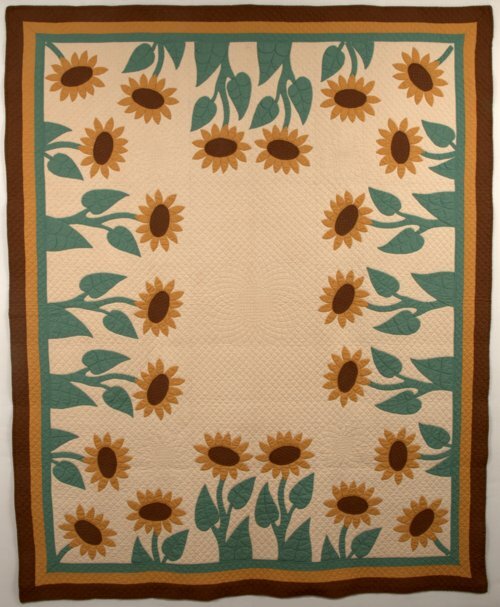 Cotton with close hand quilting, including a grid design interrupted by a large central sunflower. Pieced by Kansas City resident Hattie A. Chandler in the early 1930s, and quilted by Lillian and Gladys Pine of Lawrence. The quilt won a First Place award at the Kansas State Fair in the mid-1930s.